It's all kicking off here in Pennsylvania. I managed 35 miles yesterday before stopping due to tiredness. Strangely, I couldn't sleep so I ran another 7 miles giving a total of 42. Just after I stopped for the day, the RV got pelted with rocks by some teenagers in a passing car! I knocked one of my blisters as I screamed at them out of the window. I now have a huge section of exposed skin on my left foot. Despite this latest knock, I'm now determined to get to New York more than ever. I'll catch up with the blog as best as I can over the coming days. Time is tight. There are 368 miles left to run over the remaining 9 days. I'm dedicating today's miles to the memory of Sir Bobby Robson who I had the pleasure of meeting in 2003. Day 89 was, quite frankly, one to forget. The day started overcast but that didn't last long as the hot weather made an unwelcome return. I was gutted when I saw that the previous night's road closure was actually for a road other than the one I wanted. It was dark when I finished last night so it was an easy mistake to make. All of today's route was either up or down hill. I felt like I was doing more climbing than in Utah and Colarado put together. Part of the route took two twists today. One due north for a few miles, then another similar route due south. The road north deteriorated into sharp stones eventually. This played havoc with my feet and ankles. 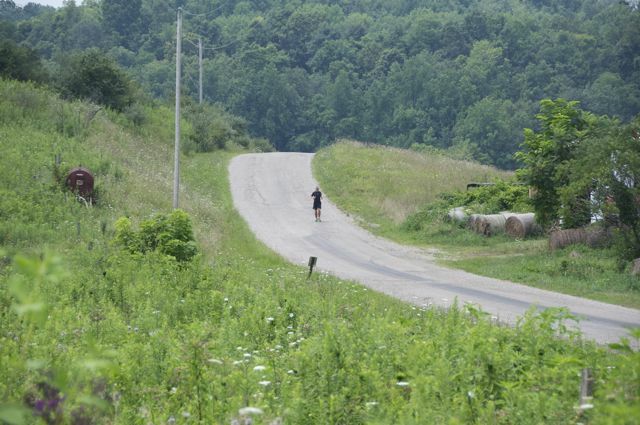 It reminded me of that horrible unmaintained section of route 66 that I'd ran on some 84 days ago! I exchanged a friendly wave with some Amish folk on the road riding horses. Route 66 was never that friendly! Alongside the route south, there was the possibility of a shortcut. It looked reasonable on Google Maps and would save about 4 miles if successful. Unfortunately, the route had changed somewhat since the satellite image was taken. This cost me about 1.5 miles with a lot of energy wasted climbing up and down a huge hill. The planned route was, once again, proving tough to run on with large sharp stones digging into my feet. This was starting to show in my running style. 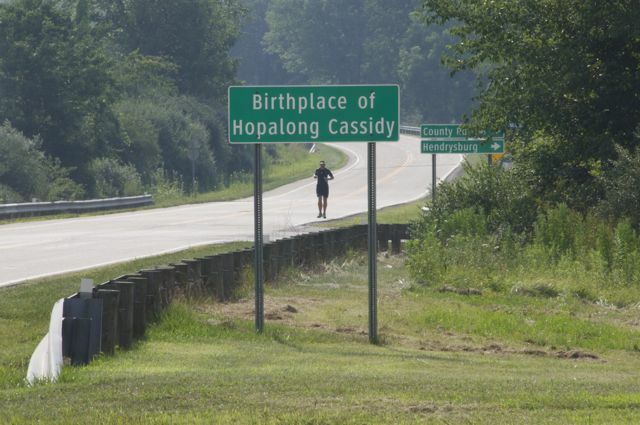 How apt that I ran through the birthplace of Hopalong Cassidy! After some pasta at the final stopping point of the day, I started to feel quite good. 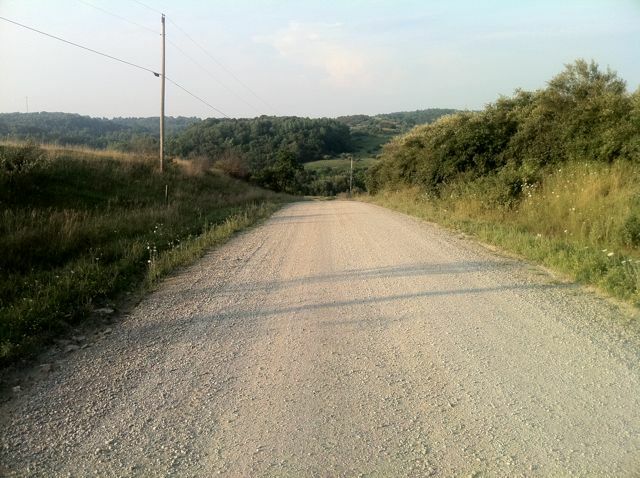 The roads were now paved, the sun had gone down and I was able to pick the pace up. 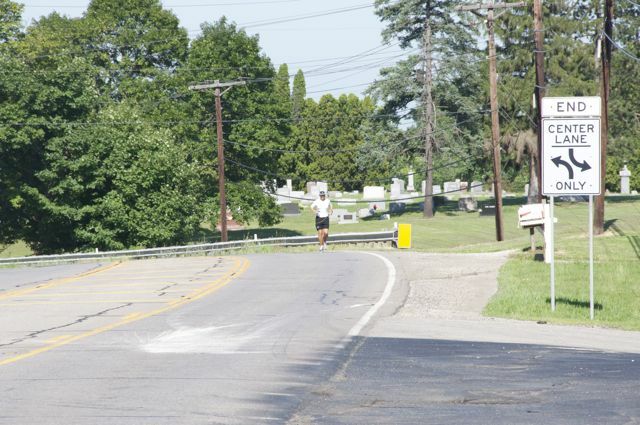 I made it to St Clairsville, Ohio having ran 37 miles. That was not a bad haul of miles considering what a tough day it had been. Today's Breakfast was sponsored by Owen McMahon, lunch was Kate Russell, dinner was Graham Thornton. Had the team managed to find anywhere to dump the RV waste it would have been sponsored by Dan Sleeth. Hopefully, that will be addressed soon! There are "only" 410 miles left to run over the next 10 days. It's a simple sum that tells me that 41 miles per day are required over the next 10 days. 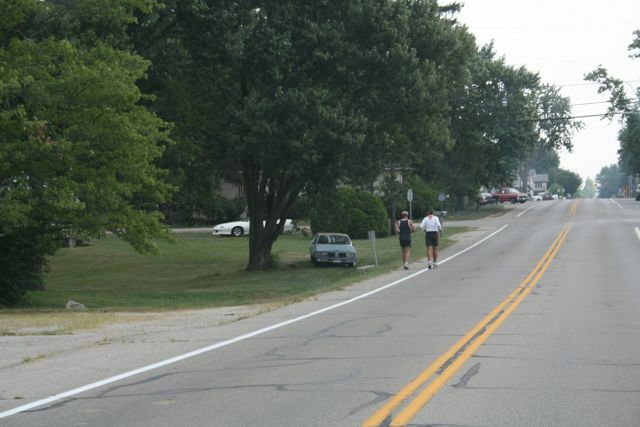 They are big miles and the risk of injury increases greatly with that kind of daily distance. I'm simply looking at it as 10 one off runs. Today's miles in Pennsylvania are dedicated to the memory of Sarah "Muddi" Butler. The following dedication was made by Billy Butler and Barbara Johnson - "Everyone's Mam should be special to someone and our's was to us.". A pain in the foot! 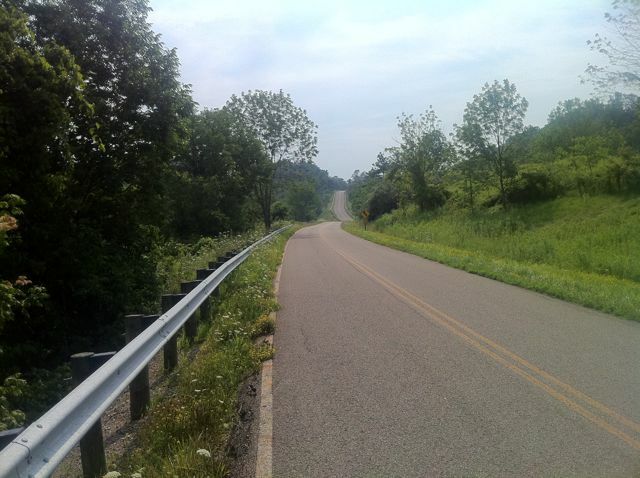 Day 88 started at Mount Sterling just west of Zanesville. It was a cooler day than of late. However, temperatures were still in the 80s. Zanesville was full of character. 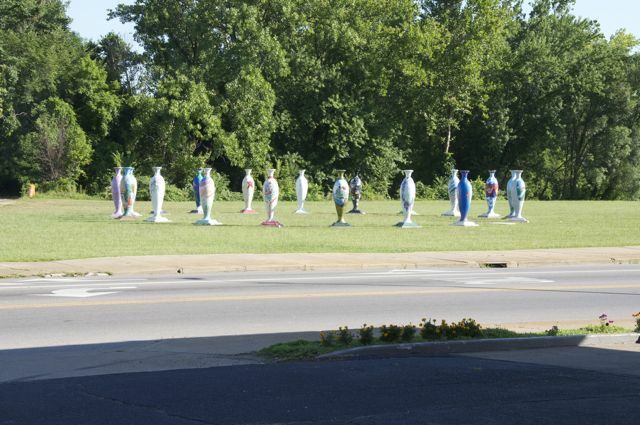 I ran past the vases in the picture below, placed in the middle of town. Also, like many other places I've ran through recently, there were very few people around. It's a rare thing to see folk walking the streets. I'd been up until 1 am the previous night updating my blog with news and pictures from the match. I was very tired as a result and had to take a Tactical Snooze in the afternoon. Later in the day I reached the town of Cambridge. 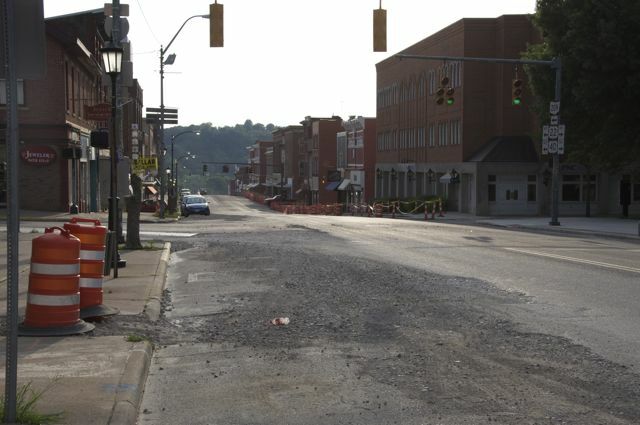 The roads were all ripped up and it was not a pleasant place to run through. 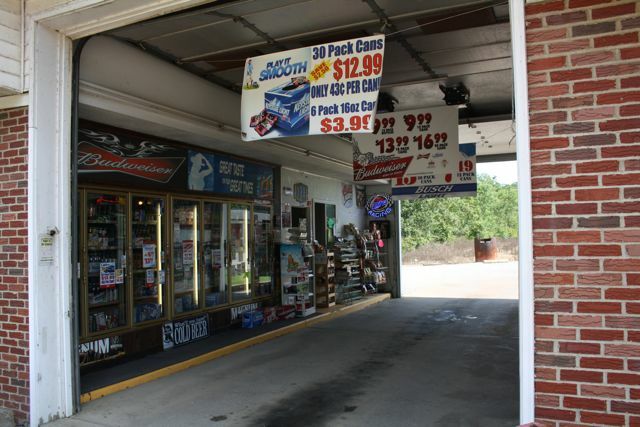 Yet again, the streets were empty in another small American town. The day finished in the dark and I was almost falling asleep after mile 30. Nevertheless, I kept going and managed to run 38.8 miles. Shelli in the RV reported that there was a road closure ahead and I was disappointed to stop just short of 40 miles. Today's breakfast was sponsored by Owen McMahon, lunch by Michael Deeble and dinner by Hannah Cakes. With Carlton's arrival on the team came the return of sponsored meals from Northern Rock IT staff. Monday's breakfast, lunch and tea were sponsored by Jeff O'Brien. Tuesday's breakfast was sponsored by Owen McMahon. Lunch and the RV waste dump for that day were sponsored by Martin Chisholm with dinner by Graham Hetherington. This little sponsorship deal will run until the end of the run now and has yielded a few hundred pounds for the charities. Brilliant! I wanted 40 miles today and I got 40 miles. I've got a few issues with my left foot which hopefully won't cause me as much pain tomorrow as it did today. 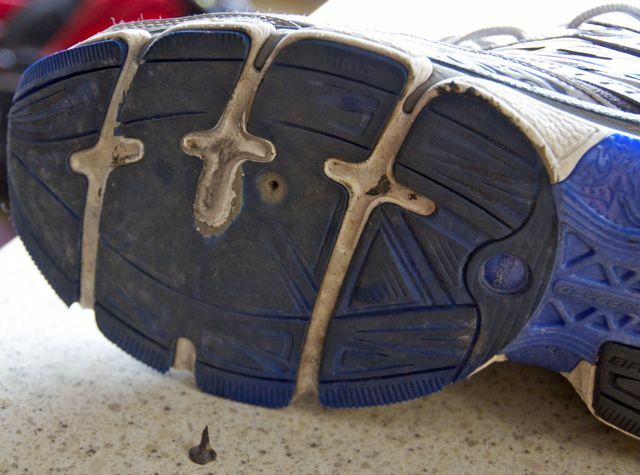 I've been running an unknown number of miles with a nail in my shoe which seems to have caused one of the problems that I have. Thanks to support man Carlton today whose witty banter helped get me through a few miles. 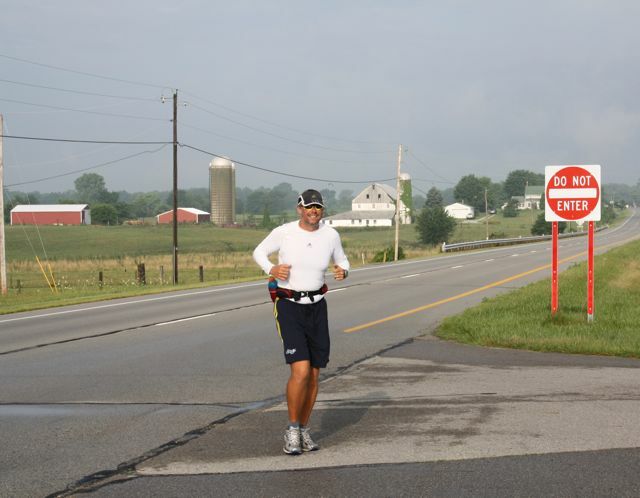 I will be running through 3 states today - Ohio, of course, followed by West Virginia and then into Pennsylvania. Today's miles are dedicated to the memory of James Neil who was the Grandfather of Kirsty, my sports therapist on weeks 3 - 6. Must get straight off to sleep so just a quick post to say that I managed to run 37 miles today. 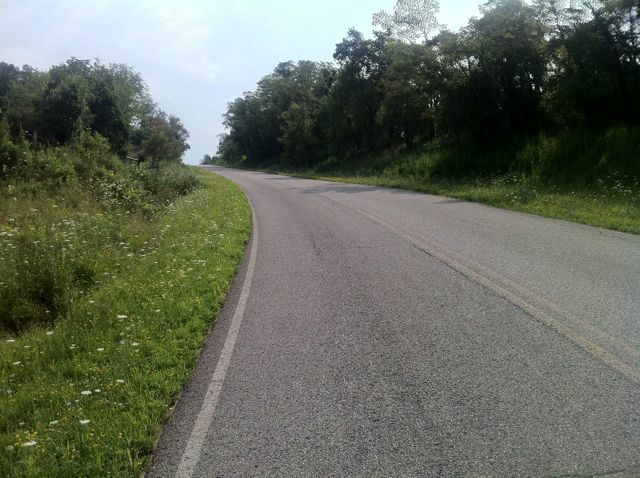 The terrain and substantially repetitive climbing made this day the toughest for weeks. Even tougher than the recent hot weather days I would say. Thank you to everybody who has made a donation today. It makes these unbelievably tough days worthwhile. Finally, please listen out for me on the Real Radio Breakfast Show with Gary and Lisa on Friday morning. 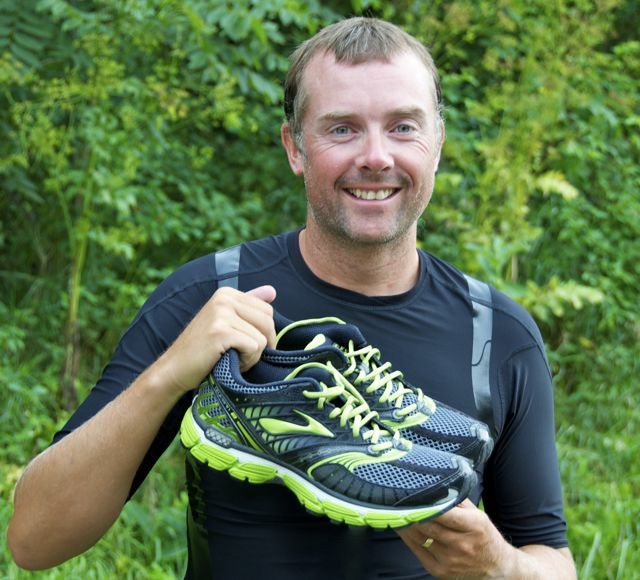 Thanks to Brooks for flying out a pair of Glycerin 9 running shoes for the final 450 miles. I've managed to run 38.9 miles today. 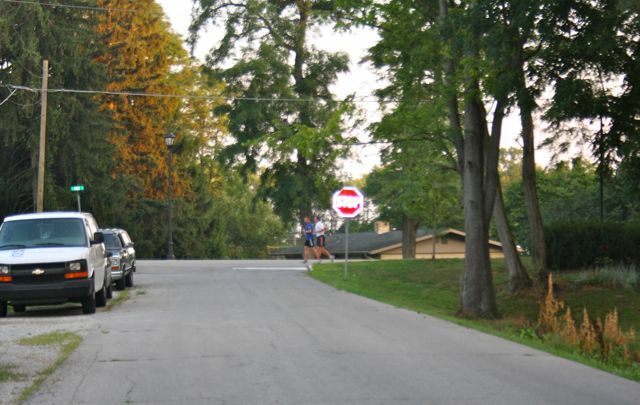 I was on course for 40 before hitting a 2nd "Road Closed" sign of the week. I'll have to figure that one out in the morning. I'll bring the blog up to date asap. I must get some sleep now though for a crack at another 40 miles tomorrow. The required run rate is now 39.6 miles. It's a simple enough scenario. Run 39.6 miles for the remaining 12 days and I make it to the finish line on time. 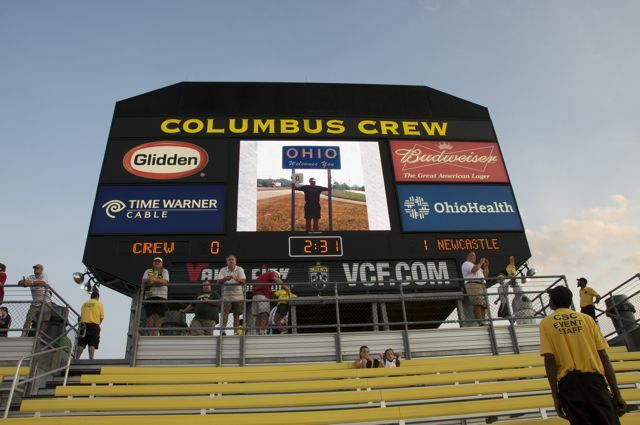 Before I go off to sleep and dream of the Columbus Crew cheerleaders again, I must say another massive thank you to everyone who made a donation today. The charity fund currently stands at £45,282. The plan for day 87 was to run at least 18 miles before heading off to watch Columbus Crew entertain Newcastle United. 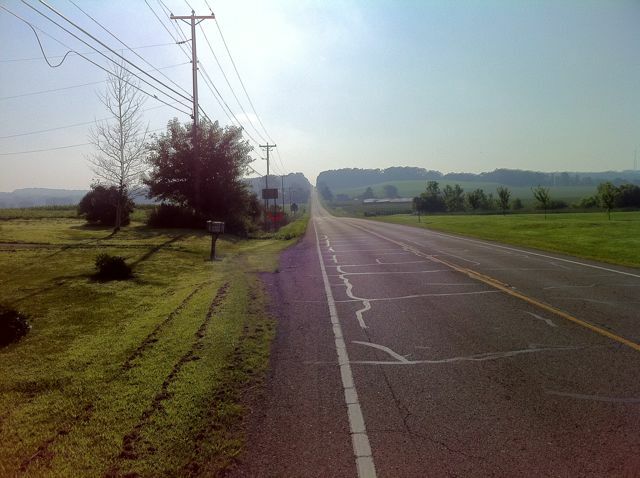 I started off at a slow pace along Highway 40 in Ohio. The hot sun beating down together with the numerous small climbs kept my pace at bay until the 10 mile point. Accompanied by Carlton, I managed to increase the speed slightly to the first break at 12.5 miles. A tactical snooze was taken at this point. I don't think that I was tired from yesterday's 41.5 miles. It probably had more to do with the fact that I was updating my blog until 1 am the night before. It's imperative that I share this journey with as many people as I can so I wouldn't have it any other way. Carlton was in a bit of disarray at the first stop. I've enjoyed his running company but 16 miles yesterday followed by 12.5 miles today was way too much. I need to use Carlton's company wisely and sparingly over the remaining 13 days. Having someone to talk to or set a pace is a huge plus on this run. It always has been. If I lose Carlton to injury then the task is made just that little bit more difficult. Oh and he carries my water too! The second session of the day was much quicker and the miles ticked by quite nicely. 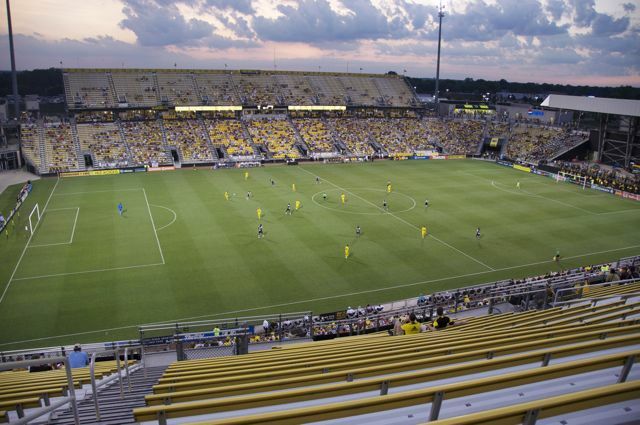 I stopped for the day at 20.2 miles and the support team and I made our way back to Columbus to watch the match and for me to perform my "Coin Toss Captain" duties. 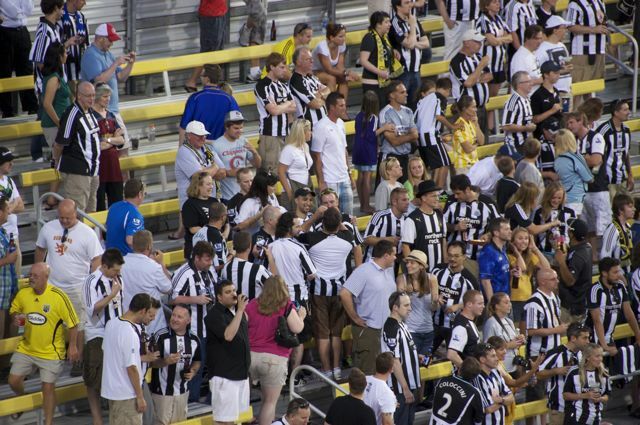 This was to be my first experience of watching Newcastle play outside of Europe. 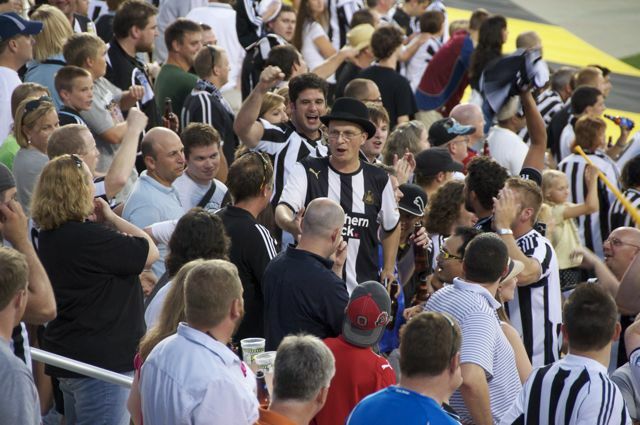 The whole match day atmosphere was very laid back and friendly. I actually felt like a valued customer when I showed my ticket at the entrance. This is stark contrast to being pushed around by Spanish match day police in Barcelona or Mallorca. 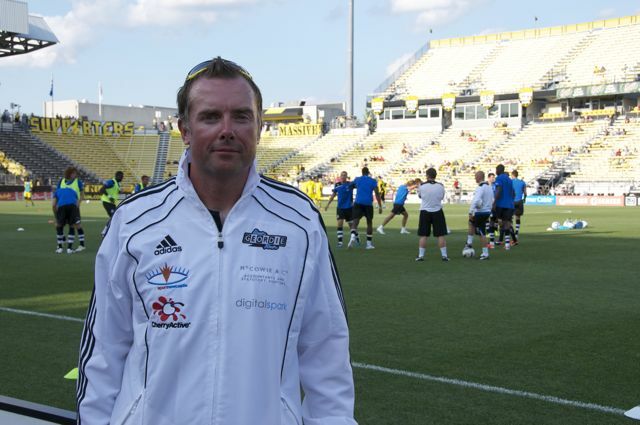 We met Columbus Crew staff Dan Lolli and Arica Kress. They took great care of the support team and I who seemed to me loving the experience every bit as much as me. 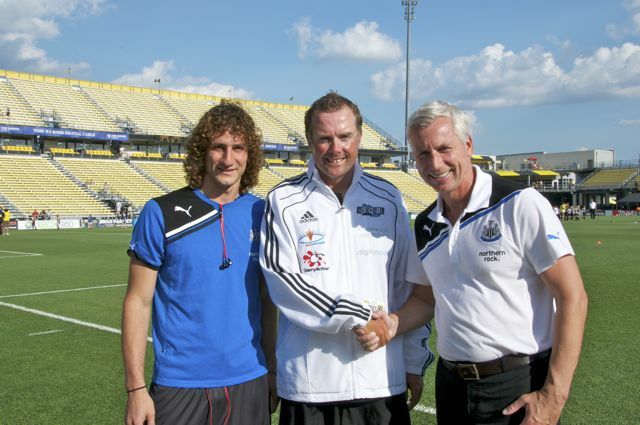 I then met Alan Pardew and Fabricio Coloccini. They asked me a few questions about the run and I told Alan that I was very match fit if he needed someone to play up front. I also had a chat with John Carver who was aware of the run across the USA. It was great to talk to a fellow Geordie and we exchanged a hearty handshake. Just before the match kicked off I was led onto the pitch by two cheerleaders. Which was nice! I then met the officials and captains of both sides. Then it was up to me to perform my duties. Coloccini called "Heads" and it landed "tails". See today's "Photo(s) of the Day" in an earlier blog post for those pictures. I was then led off the pitch by the two cheerleaders and I raced to my seat to watch the match. I'll leave the match reporting to the experts but overall it was a decent match. From what I can gather, it sounded like an improvement on the other 2 games in the USA. At half time there was a PA announcement with details of my run across the USA. This was backed up with a photo of me crossing into Ohio up on the huge scoreboards. 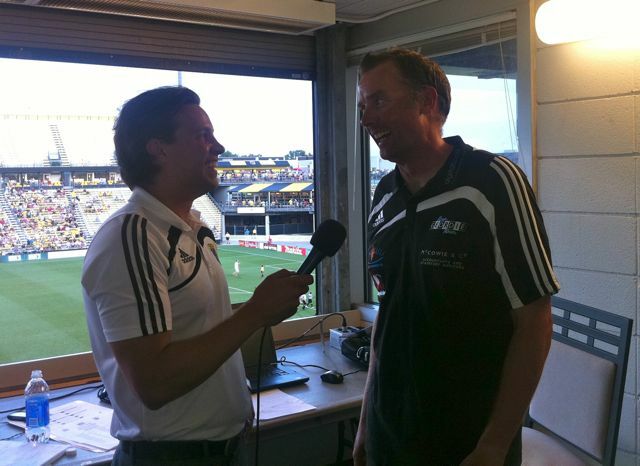 I never got to hear the PA as I was being interviewed by Neil Sika (below) for the live match stream going out across the internet. I received a lot of nice feedback on Twitter about this interview. I really enjoyed doing it and credit to Neil for asking some good questions and knowing a lot of stuff already about the run. I was able to catch up with Biffa from nufc.com and some other familiar faces before taking my position for the 2nd half. What happened during that second half will live long in the memory. Firstly, a lot of supporters came up to me and handed over some sponsor money. Thanks to everyone who did that. Secondly, thanks to the many people who came over and asked for a photo and gave me lot of kind and encouraging words. That was brilliant. I felt quite famous actually. It wasn't long before the guys and gals around me were chanting "Run Geordie Run, Run Geordie Run, Run Geordie Run, Run Geordie Run" over and over (See today's "Video of the day"). This led to more donations, photos and kind wishes. I applauded the vocal efforts of the supporters. That together with a 3 - 0 victory sealed off a great evening. A lot of the people I talked to tonight are going to be running the final few miles with me in New York on August 8th. There is also a party planned on August 9th at Legends in Manhattan. I'll publish more details about this when I know them. The support, donations and kindness shown towards me and the support team tonight was not only brilliant but also really appreciated. If I take up all of tonight's offers of drinks at that party in Legends I won't be standing long! Thanks to all the other kind folk to who made a donation today. There were quite a few and the charity fund now stands at £45,156.20 having broken the 45k mark. Outstanding! There are so many individuals to thank and I will get round to doing this when I return to the UK next month. 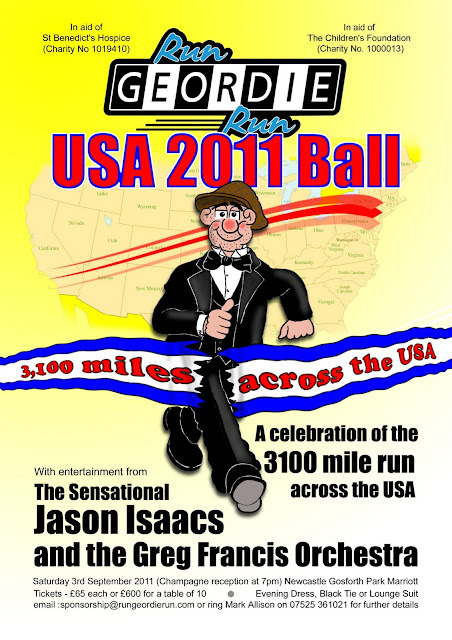 If you would like to sponsor my run across the USA then donations can be made in a number of ways. www.justgiving.com have introduced a brilliant new free donation method. Did you know that you can now donate to the 2 charities using your mobile phone? Donations can also be made direct to St Benedict's Hospice and The Children's Foundation using the following links to justgiving.com. I have my own song! 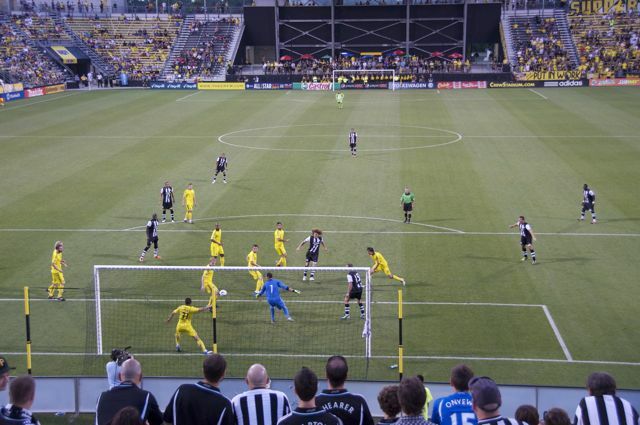 Please see www.nufc.com for news of my involvement in the Columbus Crew v Newcastle United friendly match played today. What a day ladies and gents! What a day! The day actually kicked off at 5 am when Shelli drove the RV to pick new support man Carlton (pictured below saying "hiiyyyaaaa") up from the bus station in Columbus. Carlton had travelled for 24 hours on 2 planes and a bus. He looked very tired not only from the travelling but also a close encounter with pepper spray in the bus station. After just 1 hours extra sleep, I set off running towards Columbus with Carlton. He managed 10 miles before bailing out. He's actually got a few injuries so I appreciate even more all miles that he runs with me. Carlton is a very funny guy and the first 10 miles flew over with his banter. I made it to Columbus just in time to talk to Gary and Lisa on the Real Radio Breakfast Show. This piece will be aired on Tuesday morning. I'll be talking to them again on Thursday for Friday morning's show. I'll be on the show 3 times next week and twice on the Legends. I'm very grateful to Real Radio for all of their coverage so far. It's been brilliant. The miles were ticking by really quickly out of Columbus. The temperature didn't get above 88 degrees Fahrenheit which made for a quicker than usual pace. At the 18 mile point I noticed a huge black guy pushing his car to a nearby a petrol station. I crossed the busy road to help him out. The poor guy was almost passing out. At the back window were 2 vicious dogs who seemed to be very "unhappy" with me. We managed to get the car to it's final destination and I went on my way. Moments later one of the dogs, a pit bull, came racing after me. This little blighter was clearly after a bite of my ankles so I tried using my trusty finger pointing method. The dog forced me onto the busy road where I was almost hit by a car. I "politely" shouted at the dog to "go away" (my son reads this by the way!). It took no notice so I was forced to enter into the next lane of traffic. One of the drivers saw my predicament and put himself between me and the dog. The dog gave up at this point and my heart was racing. The kind stranger made sure I was ok before driving off. That was as close as I've come to a) getting knocked over and b) kicking a dog in the teeth. I made use of my new found rush of adrenalin by getting to the 21 mile point at a very quick pace. There waiting for me was Mike Sumich, one of my followers on Twitter. He'd brought a couple of bottles of Newcastle Brown Ale for me. I'll be drinking those in New York. Thanks Mike. Mike joined me for 8 miles along highway 40 and it was nice to have his company. Mile 29 onwards are a bit of a blur and somehow I picked up the pace even more. 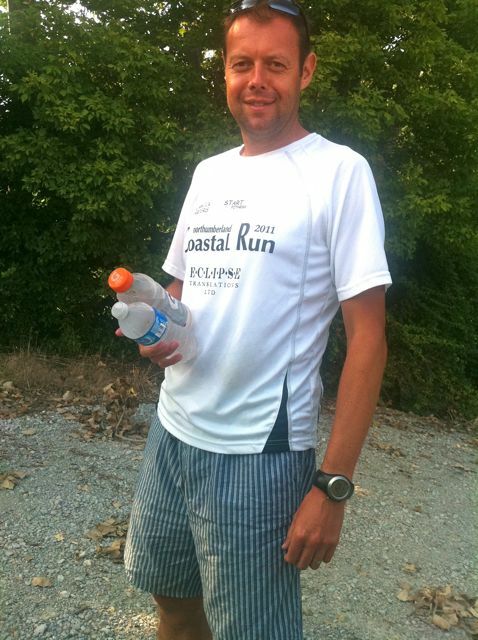 Carlton joined me again for a few miles and I'd asked Shelli to do mile 40 with me. As I approached her, I aksed her to start sprinting. It took me a few hundred yards to catch her. She was running flat out. This had the effect of me being able to increase my pace even further and I got to the 41.5 mile mark before finishing for the day. The time was just gone 2030. This was not only the furthest I've ever ran but also quicker than my previous best for 37 miles (a record set in 2009). The most pleasing thing about the finish was that I felt that I had many more miles in me. Quite a few more miles in fact. I'm certain that this record of 41.5 miles will be beaten before this run is finished. I really hope that it will be as pacy as today's too. There was a tough start to life on the support team today. 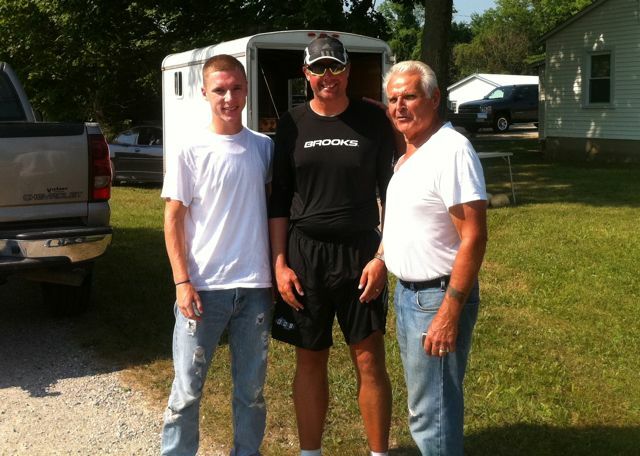 He managed to to run 16 miles with me, drive the RV and empty the RV waste (Pictured below. I forgot to tell him there were gloves available. Oops!). 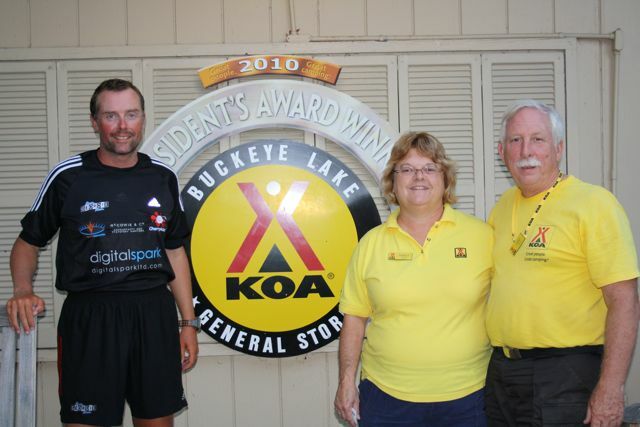 Thanks go to the KOA campsite at Buckeye Lake for putting us up for free tonight. It's a lovely place and once again I will be driving past a swimming pool in the morning, not having had the time to use it. Thanks also go to those kind folk who made a donation today including Lisa Shaw, Steve Corrigan and David Nicholson who made some generous ones. 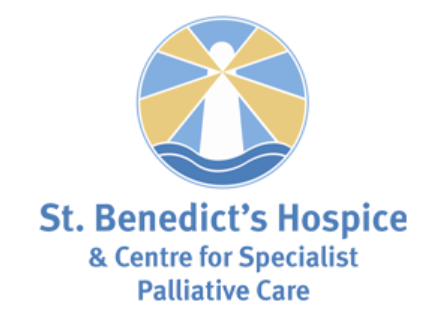 The fund for St Benedict's Hospice and The Children's Foundation now stands very close to £45,000. The dream of raising £50,000 (and £100,000 since I started fundraising) is still alive. A follower from Twitter who joined me for a few miles, Mike Sumich, with presents. Please click here to reserve your tickets. Dave and Mark dropped me off at the start point this morning and we said our goodbyes before I resumed the run on Highway 40. It was strange at first running by myself. 5 miles in, equipped with my trusty iPod, it was business as usual. I reached the expected road closure after 3 miles and I was so pleased to be able to run right through it. The 4 mile detour that I'd planned was unnecessary and Shelli simply met me in the RV at the other side. I had a break after 11 miles in Lafayette. I was so tired that I needed a 2 1/2 hour Tactical Snooze. I was out like a light. I've lost so much sleep lately it was definitely time to catch up. I started running again in the afternoon when storm clouds had gathered and there was thunder and lightning to my right in the north. The Tactical Snooze together with temperatures down to the 80s Fahrenheit meant that I was running much quicker. 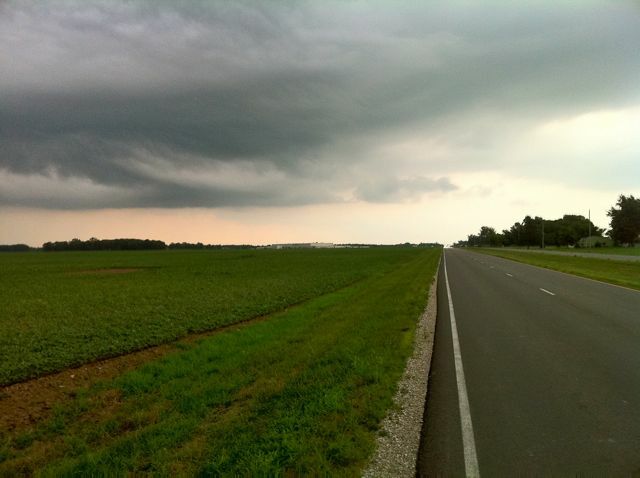 By mile 15 the thunder and lightning was drawing close to my position. I kept running with the RV in close proximity. I ran another mile through torrential rain with the lightning strikes getting much closer. Too close in fact! I was so disappointed to have to stop as I was going so well. It just wasn't worth taking the risk. An hour later the lightning had moved further south and I started running in torrential rain. 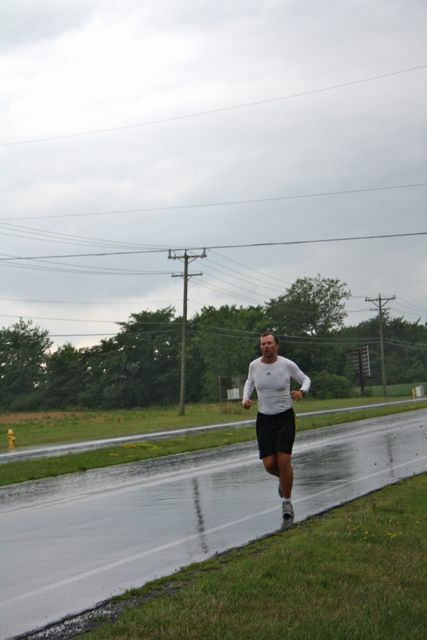 It was such a nice change to be running in much cooler conditions, despite getting an absolute soaking. By 19 miles the roads were flooded so I called it a day. Given the interruptions of the day I was happy to get to this point and have a good rest. Carlton joins the support team in the wee small hours of tomorrow morning so I need all of the sleep I can get at the moment. Day 84 was yet another scorcher (for a change). I woke up at 0615 absolutely shattered from yesterday's 40 miler. I hardly said a word to anyone over breakfast. I could just about keep my eyes open never mind speak! 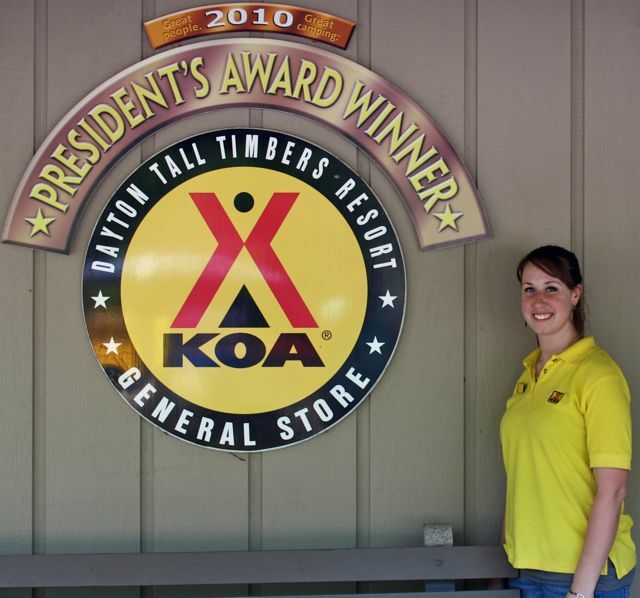 Thanks to Erin for last night's free stay at a fantastic RV park in Dayton. This one was in a beautiful forest setting. As per usual, I didn't see a lot of the park due to a late finish the previous night followed by an early start. It's a case of "take a look at what you could have won". I managed to run 12 miles before the first break. 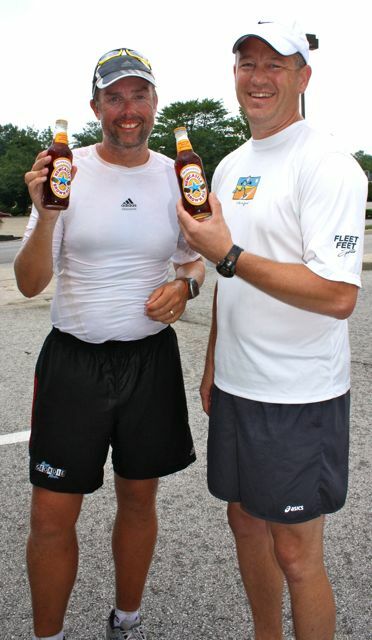 Once again, Dave and Mark took it in shifts (blocks of 4 miles each) to run with me. I was so tired at the first break so I had an impromptu Tactical Snooze in the Air conditioned Rennal Car. I was out for the count for a good half an hour. After the second session of the day another Tactical Snooze was required. Once again, I was out for the count. I've lost so much sleep recently it was much needed. Running at these high temperatures is very energy sapping too. Oh and throw into the mix the 40 milers of the last couple of days and 84 consecutive days of running. At the 32 mile point, after an early evening break for a coffee, I was on my way again. Highway 40 now seemed as familiar as highway 36 ever did. I'll be on this road for quite a while yet but not the 1000 or so miles that I was on 36! Because I don't drink coffee very often it had the usual effect of making me run quicker. Another 40 miles was a distinct possibility at this point, I thought. Mark ran miles 33 - 36 with me. It was his final stint of running with me in the USA and we recapped all of the miles that we'd ran together over his 2 visits to the USA. Dave's final shift from mile 37 was brought to an abrupt halt. There was a "Road closed 5 miles ahead - Bridge out" sign at mile 39 and a detour was called for. It was getting late and I was almost ready to call it a day when Mark suggested we drive to see if the road was passible on foot. It was too dark to tell when we got there so a quick diversion for tomorrow was planned. A bit of time was wasted doing this but it would be worth it tomorrow. I asked Mark to drive back to the 39 mile point so Dave and I could finish the day on a high. It would have been criminal not to run that last mile and get to the 40 mark. It was a decent finish, despite being after 11 pm! 40.2 miles were done in total. 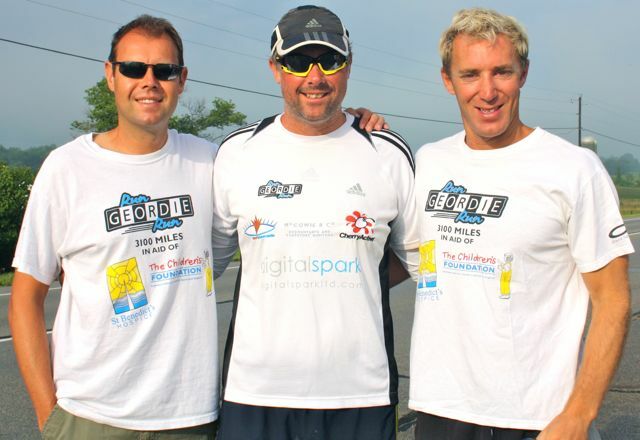 I was so pleased to have managed a 3rd consecutive 40 mile run. Especially so in the extreme temperatures that were present in Indiana and now Ohio. 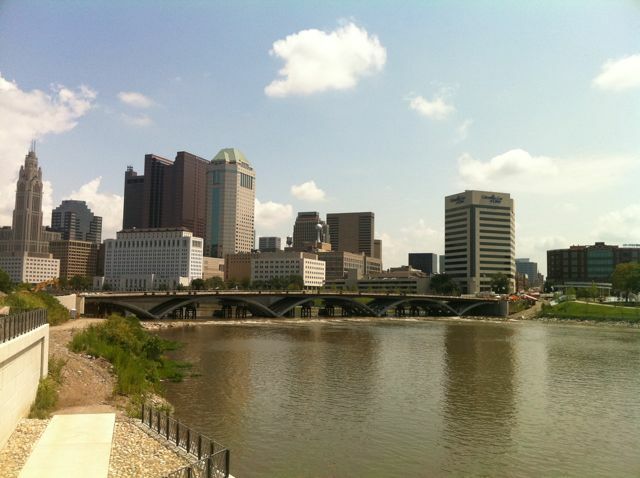 I've been getting tweets such as "hottest day in 22 years" in Indianapolis and "even the locals are staying indoors" in Ohio. Without doubt, as an "everday athlete", the last 3 days have been one of the biggest achievements I've had in running. Mark and Dave's contribution to that was a telling one with Shelli looking after the PR and logistics of the run and the RV. Finally, I can't sign off without revealing a new ritual we started this week. The Andy Pandy song is now played in the RV just before lights out. This started because of the blue and white shorts that Mark wears around the RV. They are a ghastly sight and this photo really doesn't do them justice. I know that a lot of Mark's friends, family and clients read this blog. Please do me a favour and say thank you and well done to "Andy" from me. This week's toil in the sun has paid off and the result is a reduced required run rate. It's now down to 37 miles per day. 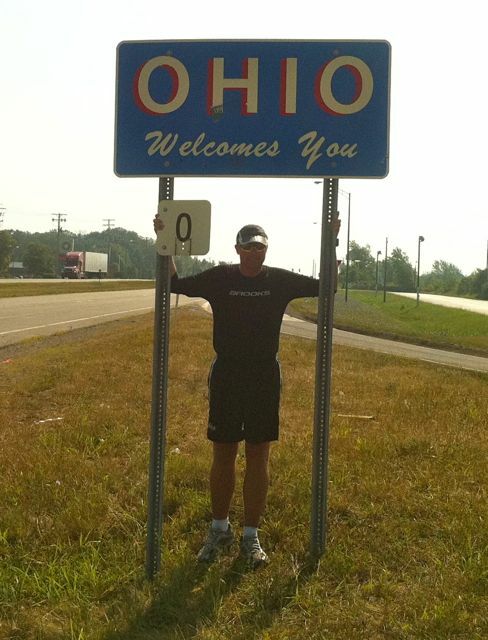 Today's miles into Columbus, Ohio are dedicated to the memory of Bill Lynn. His son, David, made the following dedication. Another 40 miles were ran today giving 120.9 miles over the last 3 days. I'll update the blog tomorrow with news of today's effort. In the meantime, I've now ran 2450 miles in 84 days leaving a required run rate of 36.9 miles per day to get to New York on time. Thanks to Bob (pictured below) and Wanda at the Archway Campground for letting us stay there for free last night. That was much appreciated. I've now lost track of the number of times we've had great hospitality or an unexpected friendly gesture. Given the current heatwave, the latest thing that happens regularly is for drivers to stop and hand out a bottle of water. It happened twice today at various times and really is appreciated. The support car is never too far away but it is lovely to have an icy cold bottle of water when you least expect it. 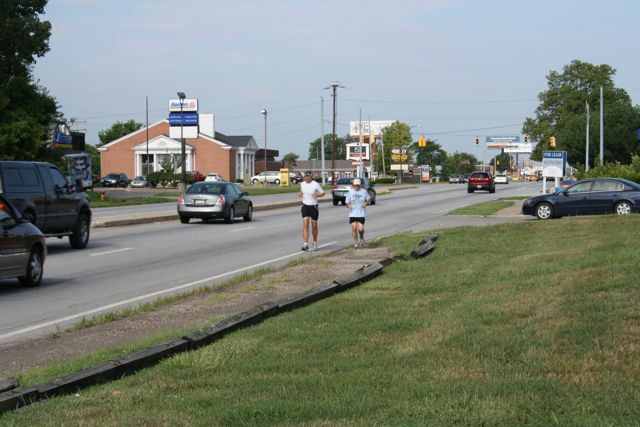 You know the drill by now - It was another red hot day as I started the run on route 40 at 7 am. 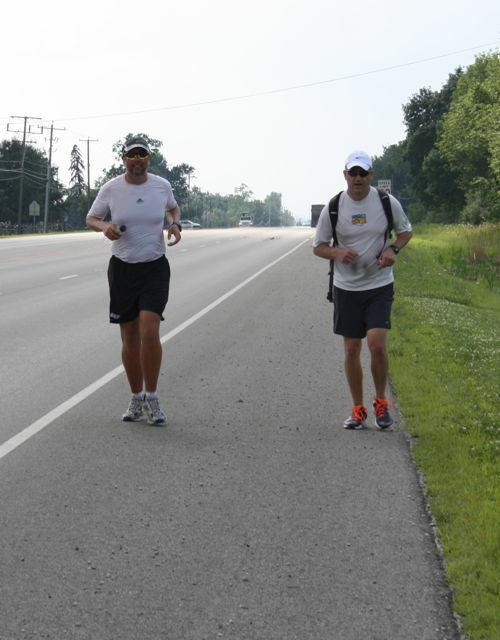 Just like the previous few days, Mark and Dave took it in shifts to run with me. I managed to find plenty of shade in Richmond and the odd garden sprinkler helped to cool things down. It was cold drinks and icy towels all day as I battled what some locals were saying were the hottest temperatures for 22 years. In actual fact, it seemed 1 or 2 degrees cooler than yesterday. Overall, I felt a lot more used to the heat today. I should do by now given that I've been running in it for many days recently. The next breaks were at 23 and 34 miles for some porridge and pasta respectively. I could have skipped that last break as I was feeling very good at the 34 mile point. It is sometimes difficult to know what to do for the best. The strategy worked and energy levels were very good. The remaining miles through Englewood were very painful. All of the toes on my left foot were in a lot of pain and felt very numb. I stopped a few times to change my socks and shoes and this helped a very small amount. The final mile was ran on a dark bridge with a very narrow shoulder and no escape. Maximum concentration was needed to cross it safely and I was pleased to see the support car having run a very pleasing 40.3 miles. It's been a good 11.5 miles so far today in very dangerous conditions. The heat, once again, is quite something with news of the heatwave hitting the BBC today! I've managed to find a bit of shade this morning and a couple of garden sprinklers to soak myself in. I've also left Indiana and I'm now running in Ohio! Finally, I must say Happy Birthday to Georgia, an avid reader of the blog, who is having her 11th birthday party today. Happy Birthday Georgia. Day 82 - Unbelievable finish! I seem to be thinking this a lot lately - This was as tough a day as I've ever had on this run. Soaring temperatures well above the average for this time of year, high humidity and no breeze meant a punishing first 11 miles. Due to having a terrible sleep the night before I had to have a tactical snooze during the first break. The RV was so hot last night it was unbearable. I slept all night with a battery powered fan in my face. Warm air was better than no air! After the restart I felt very groggy indeed. I was faced with 2 choices at this point. Further rest in the air conditioned rennal car or just to run and get on with it. I chose the latter and during the first mile after the restart my knees buckled a bit. I was not in a good way but thankfully Dave and Mark took it in shifts to run with me and supply me with fresh water and icy towels every 2 miles. I had one icy towel around my neck and one over my head all afternoon as the temperature hit 115 at one point. I'll never figure out how I was able to keep running in that temperature. The banter from Dave and Mark had a lot to do with it as it kept my mind off the horribly difficult conditions. I had another break at 23 miles and then a final one at 32 miles. At the final break I had to ice my feet, take pain killers and play my usual ace card; consume an energy gel. Once the sun dipped, I was like a different runner. I had my technique back to what it should have been and my breathing was spot on. It was a quick final 8 miles. I wouldn't have put a penny on that kind of finish when I was almost on my knees earlier in the day. I can only liken today to a boxing match. I tried my utmost best to stay on my feet round after round when the going was tough. I waited for a break and when the time was right I struck the knockout blow. Hanging in there during such extremely difficult conditions had really paid off. It also helped massively to have Dave and Mark in my corner. Oh I should also mention that I managed to run 40.4 miles which is a new record for me. It's no wonder I burned 5250 calories! I should also mention that Dave's face was a picture during the last mile when a howling noise was heard in the dark woods to the left of where we were running. I told him that they were coyotes. He panicked and I laughed as I think they were probably just racoons or rabbits! I've just managed to catch up with the last few days on the blog (See posts below). Today (Day 82) was the toughest day for a long time. Scorching hot conditions (110 F), high humidity and no breeze meant I had to battle through almost every mile. The last 5 miles were sensational as I managed to clock up a total of 40.4 miles. That's a new record for me, beating last week's 40.1 mile effort. Dave and Mark were instrumental in getting me though the day in a decent time. Full report to follow soon. Thanks to all of of those kind folk who have made a donation to the 2 charities. The fund now stands at £44,208.20. If you would like to sponsor my run then donations can be made in a number of ways. www.justgiving.com have introduced a brilliant new free donation method. Did you know that you can now donate to the 2 charities using your mobile phone? Day 81 - Could it BE any hotter? Day 79 - The hottest day yet! Day 78 - Emotionally tough! Day 76 - Sooooo tired! Day 73 - Stopped by the lightning! Day 66 - I feel the need, the need for speed. Day 65 - We're not in Kansas anymore! Day 65 - Best day yet!